About Face Theatre is pleased to continue its 2016-17 Season with the Chicago premiere of THE TEMPERAMENTALS, Jon Marans’ Off-Broadway hit about America’s first LGBT rights organization. Directed by Artistic Director Andrew Volkoff, THE TEMPERAMENTALS will play January 13 – February 18, 2017 at Theater Wit, 1229 W. Belmont Ave. in Chicago. Tickets are currently available at aboutfacetheatre.com, by calling (773) 975-8150 or in person at Theater Wit Box Office. THE TEMPERAMENTALS features Paul Fagen, Lane Anthony Flores, Kyle Hatley, Rob Lindley and AFT Artistic Associate Alex Weisman. THE TEMPERAMENTALS chronicles the founding of the Mattachine Society, the first sustained LGBT rights organization in the U.S., and the love affair of two of its founding members, Harry Hay and emigree Rudi Gernreich. Taking its title from 1950’s slang for “homosexual,” Marans’ play examines what it took to stand up in the sea of grey flannel suits and demand your humanity, your visibility and your rights. 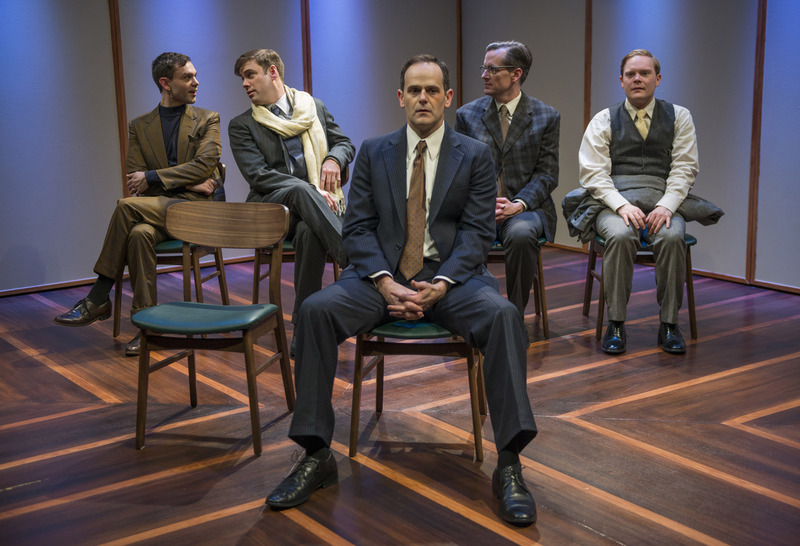 left to right) Lane Anthony Flores, Kyle Hatley, Paul Fagen, Rob Lindley and Alex Weisman in a About Face Theatre’s Chicago premiere of THE TEMPERAMENTALS by Jon Marans, directed by Andrew Volkoff. Photo by Michael Brosilow. The production team for THE TEMPERAMENTALS includes Joe Schermoly (scenic design), AFT Artistic Associate Mieka Van der Ploeg (costume design), Becca Jeffords (lighting design), Christopher Kriz (sound design) and Sarah Luse (stage manager). Jon Marans’ (Playwright) works include The Temperamentals, which ran for over eight months Off-Broadway, nominated for a Lucille Lortel and Outer Critics Circle Award for Outstanding New Off-Broadway play and was a 2012 American Library Association Stonewall Honor Book in Literature; Old Wicked Songs, a Pulitzer Prize Finalist for Drama which ran for a season off-Broadway, played in the West End starring Bob Hoskins and has been produced in over a dozen countries. Other shows include A Strange and Separate People, Jumping for Joy, Legacy of the Dragon Slayers and The Irrationals. Mr. Marans also rewrote the book to the musical Paint Your Wagon for the Fifth Avenue Theatre in Seattle. The Temperamentals is in film/television development with Daryl Roth Productions. Mr. Marans is a recipient of a 2013 Guggenheim Fellowship. Andrew Volkoff (Director) joined About Face Theatre in 2013 as Artistic Director, where he has directed the re-imagined production of I Am My Own Wife, the Chicago premieres after all the terrible things I do, Abraham Lincoln Was A F*gg*t and Brahman/i: A One-Hijra Stand Up Comedy Show. He is a director specializing in new and contemporary works and has directed numerous productions (including several world and regional premieres) in New York, across the U.S. and abroad. Andrew served as Associate Artistic Director of Barrington Stage Company (BSC) in Massachusetts for five years and Genesius Theatre Group in New York City for three years. He also acted as the Co-Artistic Director of the Hangar Theatre Lab for one season. Andrew has worked as the Associate Director on Ella for Rob Ruggiero at Dallas Theatre Center and other regional theatres, is a Drama League Directing Fellow, and an SDC member. Proud to be the first director chosen to participate in the U.S./Bulgaria Directors Exchange Project, Andrew directed the Bulgarian premiere of John Kolvenbach’s Lovesong in Sofia at the Nikolai Binev Theatre, where it is still in repertory. B.A. : Macalester College, St. Paul, MN. About Face Theatre (Andrew Volkoff, Artistic Director) creates exceptional, innovative, and adventurous theatre and educational programming that advances the national dialogue on sexual and gender identity, and challenges and entertains audiences in Chicago and beyond.